Can only be diagnosed reliably with fluorescin under a Wood's lamp (black light). It may be advantageous to use tetracaine during the instillation of fluorescin. Otherwise saline will suffice. Fluorescin is safe to instill in any eye - even in an open globe. Please let your patients know that the tetracaine will burn during instillation. The treatment generally consists of topical antibiotics - I'll ask the parent which type (erythromycin ointment or polytrim drops) they would prefer. Generally corneal abrasions will heal well in less than a week, antibiotics can help reduce the already low risk of infection. Everting the top eyelid can allow you to visualize a foreign body which is usually behind the upper lid. Removal of material adherent to the inside of the upper lid can be done with a cotton swab, flush with saline, or needle nose forceps. 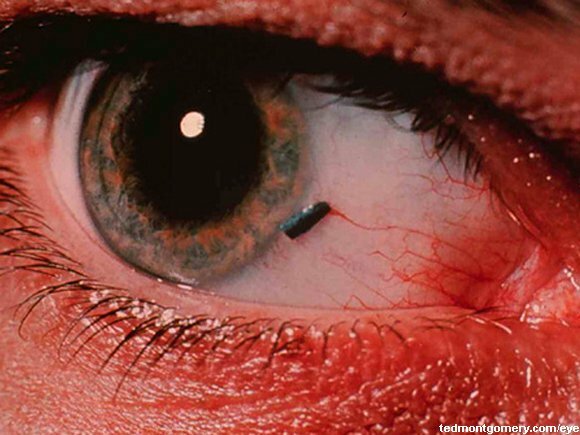 Removing a foreign body off of the surface of the eye can be done (delicately) with an 18 Guage needle to 'flick' it off of the eye. Topical antibiotics are always appropriate. A pupil that is not a circle is bad. This generally indicates that the ciliary muscles of the iris have been disrupted/compromised. This can be due to direct trauma or an open blow. Look for the patient with decreased visual acuity and extreme light sensitivity. Blood in the anterior chamber will create a meniscus like effect. These occur usually due to ocular trauma. 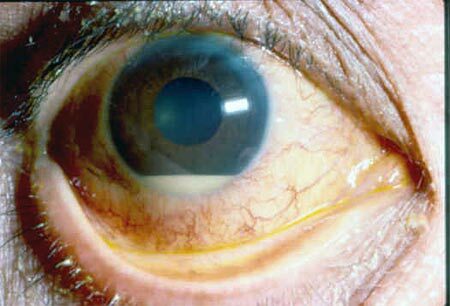 The biggest risk is of acute angle closure glaucoma. The treatment is bed rest - for patients with a a hyphema >25-50% of the anterior chamber admission might be warranted. Rebleeding can occur - and the risk extends into and in some cases beyond the second or third day. Generally fluorescin adheres to epithelium. Fluorescin that 'flows' is generally floating on the aqueous material. This is AKA Seidel's sign. The classic 'tear drop' shaped pupil is an important finding to recognize. 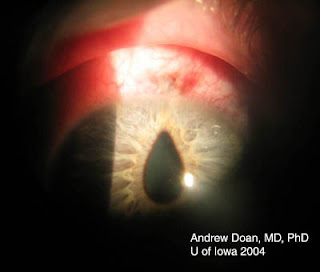 White fluid in the anterior chamber - similar to a hyphema - is a hypopyon which can be infectious or inflammatory.